Armor is a passive element of the armor, which was used by warriors from the ancient times until about the seventeenth century. In some cases, pieces of armor also appeared in the later periods. In the eighteenth and nineteenth centuries, there were heavily armored horsemen, cuirassiers, who were equipped with cuirasses and iron or leather helmets. During World War I, the most favoured officers were equipped with the so-called trench armor, whose main purpose was to protect commanders from injuries, which could have been inflicted for example by shrapnel shells. At the end of the twentieth century, the armor began to be used again in the military forces, taking the form of titanium or ceramic plates which are complementary to the bulletproof vests. Actually, the term “armor” is not precise enough. Some weaponry experts distinguish two separate types of the protective armament. There may be a kind of flexible protection or an armor formed with completely rigid components. A studded leather jerkin – the same as the one above, but additionally endowed with studs, what provided better protection. It was commonly used by thieves, as it did not block their movements, at the same time shielding from possible injuries. Chainmail – it was a dense grid of small metal rings. Even though it was a simple, it protected the body quite well. Being not too expensive, it was popular among the knights of the average level of wealth. Scale mail – a kind of a combination of a proper chain mail with a plate armor. However, the metal gaskets attached to the leather jerkin were replaced with metal plates called “scales”. It was more solid than regular chain mail, but it slowed down the movements. Lamellar armor – it was usually made from rectangular plates of iron, bronze, leather or bone, laced together into horizontal rows. It was not strapped to any cloth or leather backing, however, usually a padded undergarment was worn underneath. Armor plate - consisted of several iron or steel plates, which which were put on the torso. It provided quite efficient protection, but significantly slowed down the warrior. It proved useful as a shield against arrows, as they were hard to escape from anyway. A breastplate – it was slightly different from armor plate. It was constructed from one piece of metal of a considerable size and weight, which was formed in such a way so that it could be worn. It was hard to break and it performed best as a shield against arrows. It was used by hussars for instance. Full plate armor – it was a complete set of plating, which in addition to the armor covering the torso, contained also shoulder and knee pads, a helmet and gloves. Due to its complexity and effectiveness, it was a highly desirable commodity, but as it cost a lot, only the wealthiest were able to afford such armor. Chain metal braid was already used in the era of Hallstatt. The oldest copies of chain mail were discovered in Scythian burial mounds from the fifth century BC. The creation of this type of armor with a bronze or iron wheels is, however, attributed to the Celts. The ancient iconography is the main proof for this theory, as the actual chain mail lying long in the ground, takes the form of a fossilized skein and does not supply a lot of information regarding its original appearance. In the early days of European Middle Ages, chain mail was commonly used, as it was known there since the Celtic period. Apart from it, the scale and lamellar types of armor were common. 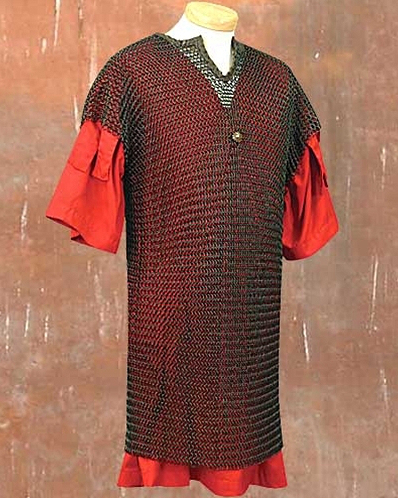 Chain armor was put on a leather or woolen doublet (later a gambeson), what improved the blow cushioning. The time of European chain mail's greatest splendor dates back to the interval between the mid-twelfth century and the middle of the thirteenth century. A British weaponry expert Claude Blair even called this period (1066-1250 r.) "The Age of Mail". At that time, the braid of chain mail covered the whole knight's body. Chain mittens were most commonly starting from chain sleeves directly. The mittens were hemmed from the bottom, leaving an excision uncovering the palm, because that was better for grabbing a weapon. The jerkin was combined with a chain hood, which looked like a kind of a high collar when it was slid down. Under the hood, a felt, linen or quilted cap was worn, in order to provide better protection as well as comfort. While on the hood, a helmet was put. However, in the East (also in the Eastern Europe, especially Russia) the head cover was constructed in a different way. The lower edge of the helmet usually served as the attaching point for the chain mail bonnet. In Western Europe, this bonnet was not adapted until the fourteenth century. Chain mail was produced by plaiting rings of various diameters, what protected it from folds and made the armor flexible and more closely adhering to the body. In areas which were most prone to injuries, the strands were thicker. In the Middle Ages, cleaning chain mail of rust was performed by shaking them in bags full of hard wood chips. In the mid-sixteenth century, the hussar troops appeared and they took the role of the heavy cavalry. Their protective armament included half-armor plate. When the Polish king Stefan Batory (who was an important reformer of the army) reigned, the ultimate form of the armament was established. Following the king's order, light half-armor was introduced. It was supposed to be put onto chain mail or with mail sleeves. Pic. 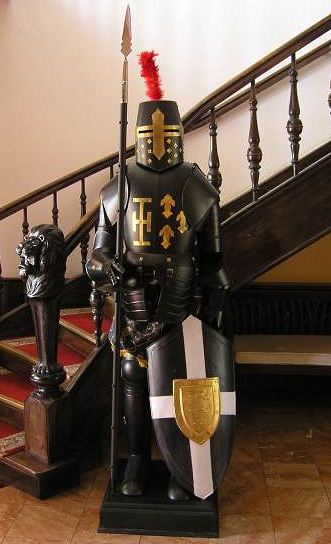 4 A replica of a hussar armor. Between the sixteenth and seventeenth centuries, hussars already accounted for a fully shaped, unified and characteristic Polish formation which aroused the interest of foreigners, as a result of their battle successes, as well as their an impressive outfits. 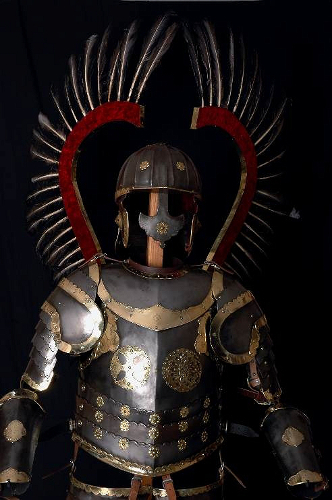 In the first half of the seventeenth century, the specific Polish hussar armor was formed. It consisted mostly of shoulder pads, a lobster-tailed pot helmet, a bevor, a cuirass and bracers. In special cases it could be expanded by fauld waist and knee covers. A lobster-tailed pot helmet (known also as a zischagge) had a semi-circular bell, often equipped with a high crest, cheeks and a fauld nape cover. At its front, there was a visor with a movable nose shield and a blocking screw, what provided better face protection. 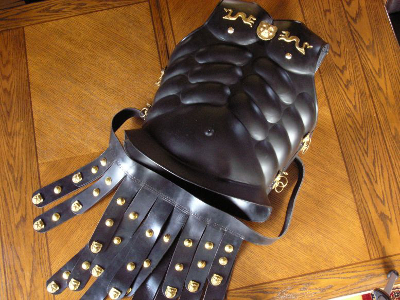 A cuirass was composed of two parts: a breastplate and a backplate. There were 3-5 faulds at the bottom of the breastplate and it was attached to the backplate using buckles and straps. A bevor was formed of two plates (front and back), while at the sides there were buckles, which the shoulder covers were attached to. Such a cover consisted of an upper fauld (which directly stuck to the bevor), a properly formed shoulder plate (of an older type – with a wide back wing and front little wings or of a younger type – with wide front and back wings) and six faulds usually, which served as the protection of the arm. A bevor was put onto a cuirass. Then, shoulder covers with faulds were added, of a length that did not reach an elbow, bracers consisting of leaf-shaped "buckets" (in a younger type - rounded) and a bracelet made of one or two parts (from the palm side). To decorate the armor, generally silver, copper, gold was used, as well as steel. Scandinavian artists and craftsmen from the Viking Age particularly stood out in this area. They achieved an amazing level of mastery in the decoration techniques. Pic. 5 The replica breastplate knight of the Knights Templar. 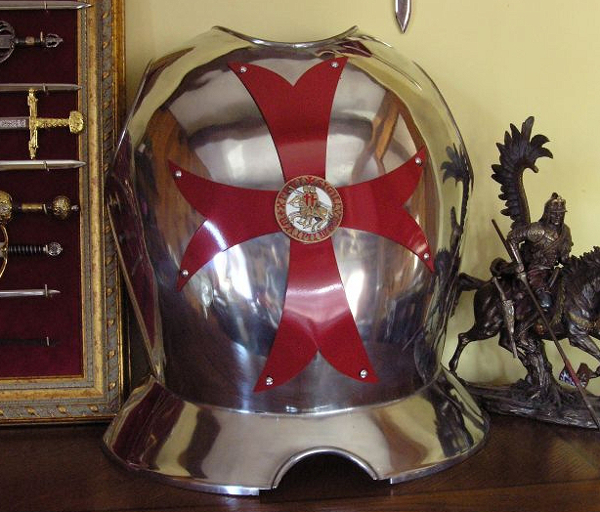 In our shop, we have a lot of great replicas of armor, rendered with stunning precision. We provide models based on various eras and cultures. For instance, we stock copies of armor used by the ancient Greek and Romans, the Templars, the hussars or even the kings. An armor replica will certainly make an ideal gift for every true history and military lover, but not only.